Hi everyone and welcome. As Eileen Hull's Inspiration Team celebrate the release of her new Sizzix Chapter 1 Scoreboards Dies releases - 'Treasure Box' and 'Stacking Drawers' - we have been sharing lots of new projects to showcase some of the possibilities for using them. Make sure to check them all out on Eileen's website HERE. For my project this month I created a 'Treasure Box' with a pitted enamel finish which owes itself entirely to a fantastic tutorial by Brenda Brown (Bumblebees and Butterflies) which can be found on her blog HERE. The box started with a sheet of 12 inch square piece of smooth card onto which I pulled a mottled Gel Plate print in shades of Umber, Sterling, Sedona and White from Dina Wakley's Acrylic Paint range. The card was cut in two and glued to some 6 inch wide pieces of mountboard before being covered with a couple of coats of thin gloss varnish. Given what happened later I would omit using the varnish in future. From these two pieces of 6 x 12 inch mounted card I was easily able to cut the sides, lid and base of the 'Treasure Box' with Eileen's Scoreboards XL Die from Sizzix, all of which matched up beautifully and were scored by the die ready for easy assembly. Once put together the varnished finish on the box looked a little flat and uninteresting. Luckily at this point Brenda shared her wonderful Pitted Enamel tutorial so I decided to give it a go. Brenda shares the ingredients needed to get the perfect finish on her blog - I kept mine simple by using Umber paint in the pits and on the edges of the box. Remember I mentioned not using varnish in future? That's because a varnished finish doesn't grab the heated powder and paint in quite the same way and can lead to some of it peeling off but it's a good lesson learned. To secure the lid in place I added a couple of bronze tone hinges from The Funkie Junkie Boutique using brads. You can see that Pitted Enamel surface and the pattern on the base card in more detail here. On the front of the lid more brads were used to secure a coordinating bronze tone mini box handle, again from The Funkie Junkie Boutique. To add a little decoration on the box lid I kept it relatively simple, layering up some branches from Eileen's 'Birds & Butterflies' Thinlits Die Set (coloured with Umber and White paint) floral arches and little flowers from Eileen's 'Floral Arch & Words' Thinlits Die Set (coloured with Olive and Turquoise paint) and leaves from Eileen's 'Journaling Cards Flowers & Leaves' Thinlits Die Set (coloured with Sedona paint). Finally one of those happy accidents - last year in a clear out I came across some old 3 x 5 inch index cards which fit perfectly inside the finished box. It will provide the ideal place to store seed packets, plant tags and notes about the upkeep of the garden. That's it for this month's Eileen Hull Designs project from me. 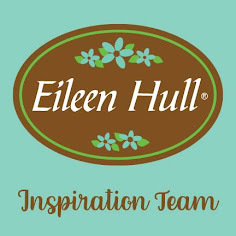 Make sure to check out the projects from the talented members of Eileen's Inspiration Team on her website HERE. Hi everyone and welcome. Over at the Frilly and Funkie Challenge blog we are in a decidedly romantic mood. It's Sara Emily's turn to host and she's calling her challenge 'Let Me Count The Ways'. Sara Emily says "Since it's just a day away from Valentine's Day, the opening line of Elizabeth Barrett Browning's famous love poem "Let Me Count the Ways" (Sonnet 43) comes to mind. "How do I love thee? Let me count the ways." For this challenge, I would like to see your vintage or shabby chic project that includes three of something. This could be three colors, three words, three stamps (you get the idea); just be sure to tell us what those three elements are." For this one I've altered a Tim Holtz Small Etcetera Tag and featured his new Sizzix Alterations 'Large Stems' and 'Tattered Butterflies' dies. The base of the Tag was covered in a Ranger Gel Plate print using Dina Wakley Media Acrylic Paints (Turquoise, Sedona, Evergreen, Ancient and White) over which I stamped Tim Holtz 'Ledger Script' in Jet Black Archival Ink. A line of numbers from his 'Merchant' stamp set was heat embossed with Ranger's 'Turquoise' Embossing Powder (Wendy Vecchi's 'Garden Patina' Embossing Powder is a great alternative). Then a layer of Ranger's Texture Paste 'Opaque Crackle' was applied through Tim Holtz Layering Stencil 'Code' and allowed to air dry. The base was finished by blending Wendy Vecchi's 'Potting Soil' Archival Ink around the edges. Since the new 'Large Stems' die is a Bigz die it was possible to cut them from heavy weight chipboard, making them ideal for weaving together with wire and burlap string in three different shades. The three stems were painted in Dina Wakley Media 'Evergreen', 'Sedona' and 'Turquoise' Acrylic Paint and edged with the Wendy Vecchi's 'Potting Soil' Archival Ink and I added small gemstone chips from Emerald Creek Crafts to the binding once secured. They were added to the Tag over offcuts of lace and burlap ribbon from The Funkie Junkie Boutique (Linda always has a lovely selection of designs in stock). The 'Tattered Butterfly' was cut twice from card covered in Tim Holtz Design Tape and I chose to use three words from Tim Holtz 'Quote Chips' pack to finish the Tag. 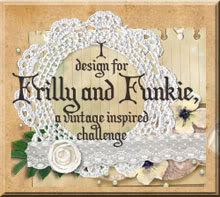 So that's my take on using 'Let Me Count The Ways' for the current Frilly and Funkie challenge. My talented team mates have created lots more amazing projects for this challenge so make sure you hop on over and check them out HERE. 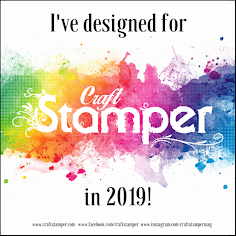 And remember to link up your own shabby chic or vintage projects featuring multiples of three to be in with a chance of winning one of the fabulous prizes.